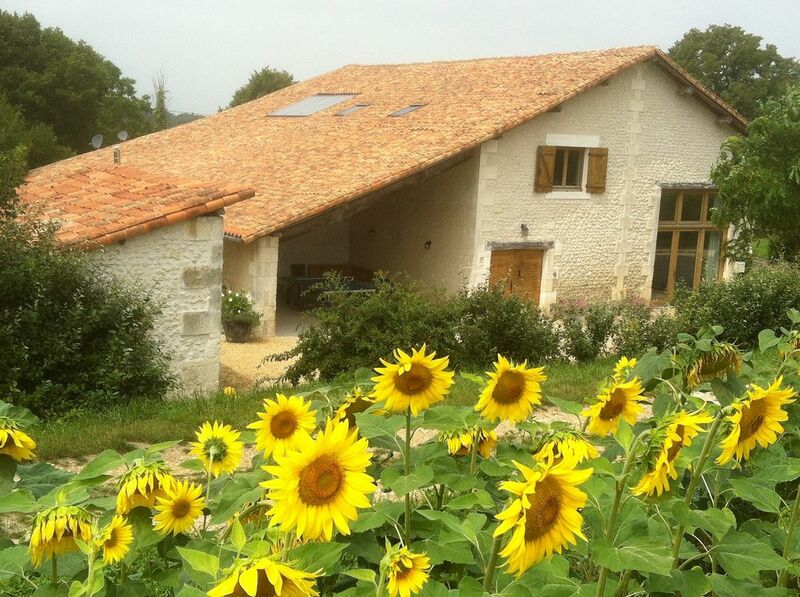 Les Gravats du Bost is a recently completed barn conversion, restored to a high standard, and offering light and spacious accommodation for large or combined groups. The 6 generous bedrooms (one of which is on the ground floor) sleep 12 (additional cots can be provided) and the open plan layout incorporates 3 bathrooms (one on the ground floor), 3 large reception rooms, one of which is a beautiful timbered kitchen and dining room. Outdoor facilities comprise a new heated 10mx5m swimming pool (installed in 2014) with a large outdoor eating area, a covered games space (with games equipment including table tennis, badminton, rounders, croquet, footballs and bicycles!) and plenty of terrace and pool seating. The house is situated in a quiet and private setting with gardens of 1 acre and beautiful valley views. Conveniently near the beautiful villages of Aubeterre-sur-Dronne (one of Les Plus Beaux Villages de France) and Bonnes, and on the Charente/Dordogne border, the property has easy access to rural and city attractions. The region is well known for its markets, restaurants, food and wine and the cities and towns of Bordeaux, Bergerac, Saint Emilion, Brantome and Cognac are all approximately an hour's drive away. In addition, the beautiful coastal towns of La Rochelle and Royan, as well as the islands of Ile de Ré and Ile d'Oleron, are wonderful places to visit for the day. The property has been furnished and equipped to a high standard, with very comfortable beds and furniture, excellent equipment, linen bedlinen, cotton towels, solar panels providing hot water and underfloor heating / wood burner for bookings at cooler times of year (this is a stunning area to visit in the winter!) Its open plan layout and private location make it ideal for large family or combined groups. We moved to this beautiful part of France in the summer of 2007 after falling in love with the area during previous visits. We had bought the barn as a long-term project but, after working on it in the holidays for two years, finally made the decision to move our family here to live permanently. We completed the renovation and lived very happily at Les Gravats du Bost before buying and renovating a small farm a little distance down the track. 2014 sees the launch of Les Gravats du Bost as an idyllic retreat for people seeking the same peace and quiet mixed with the beauty and elegance of French life. As we develop our garden and farm with its fruit, vegetables, hens, bees and herbs we aim to develop ways of further enhancing the holiday experience of those who visit Les Gravats du Bost. We love this area because of its gently rolling landscape ("every house has a view! "), quiet lifestyle, wonderful food and wine, access to beautiful cities, wonderful climate and outdoor life, the strong sense of community within villages. Very good restaurants can be found even in small, nearby villages, such as Aubeterre-sur-Dronne and towns like Chalais. Excellent galleries and theatre can be enjoyed in Bordeaux as well as all the other aspects of chic city life. French life, both rural and urban, promotes family living and our family has thrived in its safe, supportive and friendly environment. The social life of family and friends is all important here and time is taken to be together and enjoy time shared! Visitors return every year and comment on the happy, relaxed lifestyle here. Les Gravats du Bost is ideally placed for its visitors to enjoy the benefits of its peaceful, rural setting whilst also being able to experience French city life in nearby Bordeaux, Bergerac, Saint Emilion and Brantome. The house itself has been designed to foster hugely enjoyable and easy indoor/outdoor living - with spacious, open plan, free-flowing interiors and its secluded, safe and beautiful outdoor environment. The combination of the impressive traditional stone and timber architecture of the original building (dating back to 1840) and the elegant and simple modern finishing of its restoration, makes it a unique holiday venue, ideal for large and combined groups of all ages. toilet, shower, bidet, Ensuite to Master Bedroom. Walk-in Wetroom Style Shower. toilet, shower, Ground floor bathroom. Large family bathroom with wet-room style shower, bath, wc, washbasin. Bathroom 2 is an ensuite to the principle bedroom and has a wet-room style shower, wc, bidet, washbasin. Bathroom 3 is on the ground floor and has a cubicle shower, wc and washbasin. Underfloor heating and wonderful insulation ensure that the house is warm and inviting, even in the coldest of weathers. Christmases are magical! All bedlinen is provided - cool linen throughout. All bathroom and swimming towels provided - no need to bring your own! A large woodburner provides additional cosy warmth for out-of-season rentals. Two large fridges, one of which has a top freezer section. Basic store cupboard food items are provided. Guests love the fact that we provide such a comprehensive selection of cooking and baking equipment! The open plan dining room opens from the kitchen and comfortably seats up to 14 guests. There are generous quantities of crockery and cutlery, glasses and dining ware. UK satellite free view TV, and DVD player. French satellite TV. UK satellite free view TV and French satellite TV. A wide range of indoor (card and board games and craft/childrens' activities) and outdoor games (including table tennis, badminton, croquet, boules, rounders, bikes for all ages). A large one-acre private garden, with views of the valley below the house and opening out onto bridlepaths for walks and bike rides. Heaven! Fantastic canoe trips can be made from Aubeterre-sur-Dronne and Saint Aulaye - 5 minutes from the house. We do our best to provided bikes for all guests, regardless of age! We do not provide helmets. Good public courts are found in Aubeterre and Saint Aulaye - both 5 minutes from the house. Manoir de Longeveau (Aubeterre-sur-Dronne - 10 minutes away) is an 18 tee/9 holes course and also offers tennis courts, a swimming pool and sports barn. There are also 18-hole courses at Perigueux, Angouleme and Cognac (1 hour's drive away). A stunning course is found at Chateau des Vigiers, near Bergerac (1 hour). A beautiful private salt-system swimming pool. Can be heated out of season and on request (hardly needed!). Fully security fenced for complete peace of mind. Overlooked by terrace for monitoring. Notes on accommodation: On the ground floor is an entrance hall, a large sitting room (35m2, with the original vaulted beams of the barn exposed, full height glazed doors - a replacement for the original barn doors - and the mezzanine of the first floor encircling it), a large, fully fitted, timbered kitchen opening into the timbered dining room (equipped for and seating 12, with high-chairs if needed), a further very large sitting room (80m2 with UK satellite free view+ TV/DVD player, CD player/radio) wood burner and windows and doors opening out onto and looking out over the garden and valley beyond), spacious double bedroom (with twin beds, armchairs and fitted wardrobe), shower room (with shower, wc, washbasin, washing machine and laundry equipment). Upstairs are five spacious bedrooms and two further bathrooms (one, a large family bathroom - with bath and wet-room style shower - and the second, an en suite to the principal bedroom - with large, wet-room style shower). Outside: The garden of 1 acre offers a simple, open lawned space on which games of football, rounders, badminton, boules etc can be enjoyed. It all overlooks a beautiful valley and the property benefits from real privacy and seclusion. A new 10mx5m salt-system swimming pool has been installed in 2014 and has full safety fencing and enclosed tiled surround with chairs and sun loungers. There is a large outdoor dining and seating terrace as well as a covered games space with table tennis. A BBQ and family games are provided (badminton, boules, rounders and footballs) as well as bicycles to make the most of the beautiful country tracks which surround the property. The property is surrounded by natural and farmed countryside and it is possible to walk and cycle safely from the front door without having to use any roads. Wildlife is plentiful with regular sightings of deer, hares, buzzards, kestrels, owls, cranes, bats - and sometimes boar! Utility Room: Washing machine, ironing board and iron, laundry basket and laundry equipment. Cleaning / Towels / Linen / Maid service: Linen bedlinen is provided with a weekly change of bedlinen for stays of more than one week. For guests' convenience, both bath and swimming towels are provided. Amazing stay in the large spacious well equipped house in a great location. Our 2 families stayed at Le Bost for the last week of August 18 and had an amazing holiday here. The location is great of you want to get out and explore some beautiful towns within an hours drive or even a quick visit into Aubeterre is just as good. We made full use of all the facilities, including table tennis, bikes and swimming pool. The house is much larger than the pictures show and there was plenty of room for people to occupy different spaces if necessary and equally large enough spaces for everyone to be together if they wanted to. The facilities provided will leave you wanting for nothing other than an extra week to enjoy it! Joceline and Jerry were great hosts and made us feel very welcome from the minute of booking (12 months previous) to the minute we departed. On arrival the large vat of soup with bread and lots of other goodies was most welcome and not something that I have experienced in other places I have stayed. Dressing gowns and lavender added a bit of luxury and wow factor to the already brilliant property. If you stay here, no need to take anything other than your clothes as so much provided. We made use of the barbeque and staying outside most evenings under the lovely pergola. Highly recommended to large families of all generations as well as families holidaying together. For days out we went to Thiviers on the Velorail, Riberac Market on a Friday, Kayaking literally 5 minutes away and a tour of Aubeterre sur Dronne and the fabulous monolithe church. I can honestly say from the minute we enquired about this property we were looked after so well by Joceline and Jez. Joceline was quick to confirm, secure booking. Once booked she answered/suggest what to do locally, especially on arrival day as we all knew we would be in the are locally. Plenty of rivers to swim in locally and towns to explore before check in. The conversation is stunning! We were 3 families of 2 adults/2 kids each holidaying for the 1st time together so al little worried about getting "cabin fever" with each others company! But no fear here, everyone was happy with rooms and there was so much space downstairs to spread out in. We were unlucky with the weather, but we are British and life goes on! We still BBQ'd every night and ate outside. Facilities for kids and adults behaving like kids were perfect. swimming from dawn till bedtime, endless table tennis matches, badminton, frisbee, kite flying, football etc etc. Kayaking a must! We had the river to ourselves on the 12KM trip as thunderstorms seem to deter other kayakers that day. Kids loved it, though paddles had to be downed when lightning appeared. A few extra pounds put on with the Boulangerie in Bonnes a must every morning for breakfast and countless baguettes for the day! Far better than those from the supermarkets and a very appreciative lady who ran the shop. We managed to get all 12 bikes up and running so lots of use of these from kids and adults off exploring the area. Joceline and Jez were so welcoming from the minute we stepped thru the door. Huge hamper of goodies to see us thru arriving of snacks, meats, cheeses, beer, wine and her legendary home made soup. Both were very keen to stress to make ourselves at home and enjoy the house and not to worry about any minor breakages that would happen with 3 families with kids and stone floors. As it happens no one dropped any plates or glasses! They were always on hand, by text, if we had any questions. This property surpassed all expectations. Four generations shared this beautiful home for a week and a wonderful time was had by all. Off to a wonderful start with a delicious welcome pack provided by our hosts, we made good use of the bikes, lovely pool and array of games provided for our use. The area provides rich pickings for lovely walks, cycling and exploring towns further afield. The photographs of this property show an attractive building and surroundings but in reality it is even better than portrayed. We had a fabulous time here and everything was in place to make our stay as comfortable as possible. The facilities were excellent and the owners could not have been more welcoming and helpful. The soup provided by Joceline Mawdsley was superb and together with a quantity of food supplied to start the holiday made settling in so easy. We could not fault anything and would have no hesitation in recommending this property. We did not stray far from the property but the nearby countryside was very attractive. All in all, a fantastic holiday. The property and location was perfect. We were a four generational family and the house, gardens and pool suited us perfectly. Joceline and Jeremy were extremely helpful from the time we booked the property and ensured that we had everything we needed -as our family included two toddlers. The home made soup, bread and cheeseboard plus other goodies was a perfect welcome when we arrived after a long journey. The house was fully equipped and very relaxing. We really didn't want to leave and would love to return again. This was an ideal property for our large family holiday. We were surprised how large and well equipped it was with a good sized swimming pool. There were so many nice touches- an amazing welcome pack of food, fruit and goodies of the region, plus homemade soup! It was the perfect place to stay We had a wonderful holiday. The river beaches found at Saint Aulaye and Aubeterre-sur-Dronne (both 5 minutes' drive away) are wonderful places for relaxing, family days out, offering quiet, beautifully clean sandy beaches, swimming, tennis, tree climbing, canoeing and relaxed, very good French dining. Atlantic coastal beach resorts are approximately 2 hours' drive away. There are four very good small airports nearby, used by RyanAir, EasyJet, FlyBe, British Airways and Aer Lingus, with an excellent, regular service from the main airports of the United Kingdom. Bordeaux airport is 1.5 hour away. Bergerac airport is 1 hour 15 minutes away. Limoges airport is 2 hours away. La Rochelle airport is 2 hours away. Calais is approximately 8 hours' drive, Le Havre 6 hours, Caen 5.5 hours, Dieppe 6.5 hours, Cherbourg 7 hours, St Malo 5.5 hours and Roscoff 7 hours. The nearest villages of Bonnes and Aubeterre-sur-Dronne are 5 minutes' drive away, offering small shops, bakeries, restaurants/cafés. Chalais and Riberac are excellent, larger towns nearby with supermarkets and banks etc. Bordeaux is 1.5 hours away, Bergerac is 1 hour 15 minutes, Saint Emilion is 1 hour, Angouleme is 1 hour, Cognac is 1 hour 20 minutes, Poitiers is 2.5 hours, Brantôme is 1 hour, La Rochelle is 2 hours, Royan is 2 hours 20 minutes and Ile de Ré is about 2 hours 30 minutes away. The character of Les Gravats du Bost has been designed to reflect the remarkable area in which the property is situated : spacious, peaceful, beautifully high-quality but relaxed and family-friendly. It was our home for the first three years of our life in France and we now live in a small farm nearby, down the rural path that runs past Les Gravats du Bost. With an option of supplying the house with seasonal fresh fruit and vegetables, eggs and honey from our farm, our aim is to make your holiday a thoroughly relaxing and memorable stay. Living close to Les Gravats du Bost as we do, we are on hand to assist guests during their stay or to help with any queries. At cooler times of the year, the modern oil-fired underfloor heating system, double glazing and large wood burner ensure that the property is a sung retreat too - Christmas is an especially beautiful time here, with bright sunny days and glittering, frosty landscapes. The efficient solar panels also ensure that there is an excellent supply of hot water for visitors, along lines that are as eco-friendly as possible. This beautiful corner of France has exceeded our dreams since our move here from England in 2007. The combination of its tranquil and private, rural setting with the chic, historic towns and cities within easy visiting distance makes it an ideal location for mixed groups of all ages. The excellent local markets, restaurants and wine and food shops ensure that the whole area is a heavenly spot for food lovers! Visitors have the choice of spending their entire stay at Les Gravats du Bost, with space, privacy, swimming, leisure activities and stunning views on tap - or to venture out and visit the wide range of attractions that make France such a special place to enjoy. We are certain that all visitors to Les Gravats du Bost will return home, restored and revitalised after their very French recharging of batteries and will want to have another visit to look forward to in the year ahead! Booking Notes: A deposit of 50% is required to secure the booking. The balance is payable six weeks prior to the stay. A refundable security deposit of £500 is payable just prior to the commencement of the stay. This will be returned in full to the client within seven days of the end of their stay in the absence of excess cleaning or damage. During peak seasons, bookings are restricted to a minimum of 7 nights. Outside of these seasons there is a minimum of 3 nights. Please discuss your requirements with the owner Changeover Day: Changeover day, during peak seasons, is on a Saturday. There is greater flexibility at other times of the year and this can be discussed and agreed with the owners.